"The most merciful thing in the world, I think, is the inability of the human mind to correlate all its contents. We live on a placid island of ignorance in the midst of black seas of infinity, and it was not meant that we should voyage far. The sciences, each straining in its own direction, have hitherto harmed us little; but some day the piecing together of dissociated knowledge will open up such terrifying vistas of reality, and of our frightful position therein, that we shall either go mad from the revelation or flee from the light into the peace and safety of a new dark age." - H.P. 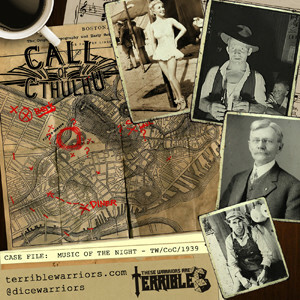 Lovecraft "The Call of Cthulhu"
The Terrible Warriors journey's into the Lovecraftian horror that is Chaosium's Call of Cthulhu RPG. Mike "The Birdman" Dodd, Brendan Frye, Bre Poisonne and Julian Spillane journey with Keeper Justin Ecock to a diner in 1939 Boston. It's the start of a very long day for our unwitting investigators and it all starts with a song. It's episode one of "The Music in the Night".